Today, you may not use the mail as often as people did in the past. Thanks to technology such as telephones, text messaging, e-mails, and much more, mail has been nearly forgotten. But it’s important to understand why mail and mailboxes are still needed even with today’s technological advances. In 1639, Robert Fairbanks of Boston, Massachusetts, used his home as the first centralized sorting and distributing center for mail. Like wildfire, society caught on pretty quick and soon enough writing letters was the popular thing to do. Eventually, Fairbanks’ home was just too small to be the only place that sorted and distributed mail. Soon after, Boston coffee houses came to the rescue. Fairbanks would pick up and drop off letters to the coffee houses in the area and residents familiar to that coffee shop would use it as their post office. Even more interesting, many people are unaware that the first postal routes were done by volunteers on horseback. In 1665, thoughts of the post office were spreading fast. More and more cities and states wanted access to other cities and states. The idea of people delivering mail by horseback was then considered and carried out. Horses were dressed in saddle bags full of letters and other pieces of mail. Volunteers, if healthy enough, would carry out routes across hundreds of miles. Some letters only took, at shortest, about two weeks to get to its destination. Other letters could take up to a month to be delivered and in cold harsh winters, people were lucky to get mail at all. In 1775, 100 years after the idea of sending a letter was considered and acted upon, Benjamin Franklin was appointed our first U.S. postmaster. That same year, U.S. congress required the establishment of set routes with specific sorting and distribution centers. Although security of the letters was a problem, many people were happy just to have a letter in the mail. Security was always an issue back in the times of the Fairbanks post office as well as it is an issue today. Important information such as documents with personal information was often lost. Today, the United States Post Office works hard to deliver mail as securely as possible. Unfortunately, people still find that their mail is often missing or never comes whatsoever. Most resort to an individual locked mailbox, never realizing that the entire community they live in most likely has the same problem. A locked mail box unit offers a solution to this problem. Security locked mailboxes are ideal to be used by major facilities where a number of people will find mail security an issue. Places such as: prisons, college dorms, private postal centers, government agencies, and military bases will find locked mailboxes a necessity. Specifically, these locked mailboxes are made from zinc die cast doors and frames. The compartments are held together with four major screws and can be stacked-two units on top of each other at a time. Each individual mailbox is capable of being locked and opened with a key. The unit itself can be mounted adjacently to each other or to wall studs. Most importantly, they are USPS certified! 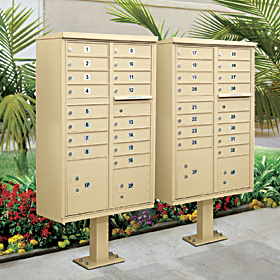 It is essential that building managers be aware of the guiding principles of mail box design in order to choose the best apartment mailboxes or office mailboxes for their tenants. USPS approved CBU mailboxes make it easy it easy for mail carriers to deliver mail quickly at a central point. This adds convenience to residential neighborhoods in remote areas, and it adds value to retail centers and office parks by getting mail delivered more quickly and efficiently.